It is the lead for a nonsensical article hyping climate alarm ahead of next week’s meeting in Poland. Most of the points made have been well debunked already, but this photo tells us a lot about the misleading spin put by the likes of Borenstein, in support of their political agenda. 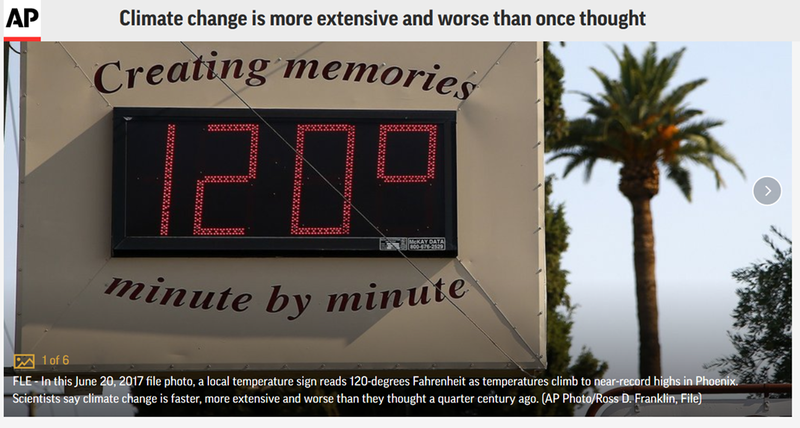 In this June 20, 2017 file photo, a local temperature sign reads 120-degree fahrenheit as temperatures climb to near record levels in Phoenix. Scientists say climate change is faster, more extensive and worse than they thought a quarter century ago. 120F – Wow!! The vast majority of people simply cannot imagine a temperature like this. It must be exceptional. Near record levels – again, the message is that something extraordinary is going on. Climate change – that obviously explains it! So let’s see what actually was going on in Phoenix. Of course, Phoenix Airport has changed out of all proportion over the years, and temperatures are artificially inflated because of the surrounding tarmac and infrastructure. There is a USHCN station nearby in the small town of Prescott, 82 miles away. Temperatures there are not directly comparable because it is at a much higher altitude. Nevertheless, the trends still tell a story. Temperatures at Prescott peaked at 105F on June 21st. This was actually higher than 1990 or 1995, unlike Phoenix. Indeed 105F is actually the record for Prescott. However, it ties with the mark set in 1925. (You will note that the Phoenix data only starts in 1940, so we don’t know if the temperature was higher there in 1925). Either way though, Borenstein’s implication that the temperature at Phoenix last year was not a natural, weather event, but instead something caused by climate change is grossly misleading propaganda. Borenstein has a journalism degree but claims to be a science reporter. He might have claim to the journalism label except that everything he writes is biased, misleading, distorted, and wrong because he only presents one side of each story. It is no surprise that he is exploiting the latest claims of the Intergovernmental Panel on Climate Change (IPCC). His article demonstrates that he is a master of propaganda and fake news. The full article is here. But this latest example of how Borenstein deceives his readers is a classic example of what Dr Ball wrote about. I agree 120F is much more comfortable. Must be the heatwave here has sent me potty! Almost hot enough to boil water. Seth Borenstein makes a living from this? The other factor about Phoenix is the staggering scale of urbanisation since the Second World War. A small town has become in just over half a century a major metropolis sprawling over a vast area. This absolutely must have increased the background heat of the area in recent decades. Why anyone gives any weight to what that guys says is beyond me. He is like the economist Paul Krugman of climate change without even the prestige of a Nobel prize to back him. Wrong on virtually everything he writes or says. Spiel any old BS, some of it sticks, that’s always been their MO, climastrology is all about more and more lies and never darest once, the truth be told. Krugman did not win a NOBEL prize . But an honorary award made up using the Nobel name . It is funny how a lot of the propaganda people try to claim things which are not actually true . That’s funny since even the Nobel site lists Krugman as a Laureate. Look at 2008. Your link is to ” Award in honour of Alfred Nobel ” . prizes . Not the real NOBEL prizes . As far as I am aware , there never was a genuine NOBEL prize for Economics . Believe what you want. The guy has the medal and prize and is listed as a Laureate. Alfred Nobel is the man for which the prizes are named. It may not be the committee that selects the winner for economics but it does award the prize. Nobel prizes are awarded for , Physics ,Chemistry , Medicine ,, Literature & Peace . This link does say that an Economics prize was introduced in 1969 , but is technically not a NOBEL prize . So , if Krugman says he is a NOBEL prize winner , I suppose it is only a technical lie . Something wrong here that doesn’t add up. The official thermometers are enclosed and in shade, so street thermometers read significantly higher than official installations, in this case there’s 1ºF difference. Even if the public thermometers are in part shade, they’re metal box and heat up during the day. I often see 52ºC in the street and when I look at the official figure it is around 44-45ºC. 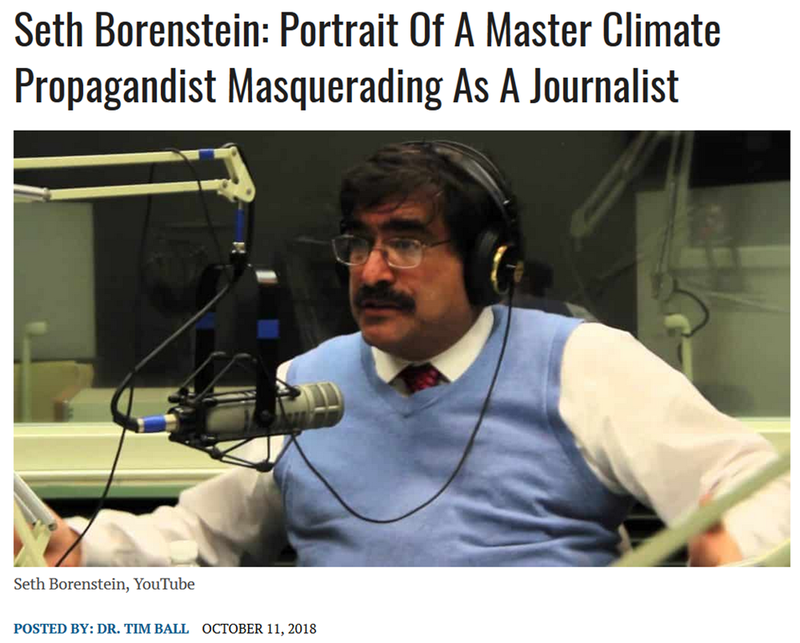 So the inestimable Mr. Borenstein is as much a climate scientist as Bill Nye the “Science” Guy? Nice to know the mouthpieces are so trained in that about which they speak and speak and speak. More doom and gloom, imminent catastrophe. More talk, more head-wringing, gnashing of teeth. … but no answer, no solution, no recognition of the huge amount of time it might take to stop this “alarming” situation.